Wers Plastics turns Polyethylene and Polypropylene in all it’s forms into a fully high density pellet. The aim of this is to safeguard the environment and to help the future growth of the business. We supply the plastic to companies who manufacture Automotive components and drainage pipe. Our Green start project created a real awareness here of the high energy costs involved in running the plant. The right approach and assistance is bringing real and sustainable improvement into the business. 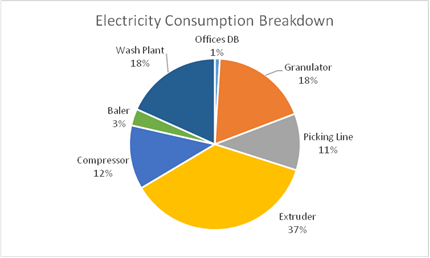 The energy efficiency review measured and provided insight into running cost and costs of stand-by energy consumption for the following equipment. HDPE pellets production and sales has improved by over 20% with 10% being attributed to efficiency gains. The Overall Equipment Effectiveness has improved. The Company now has less changeovers and breakdowns, working with mainly one product. A high quality HDPE pellet is a commodity in demand and sells easily. The increase in sales is mainly due to the increase in outputs. The heat recovery from the extruder has been specified and is being installed. Significant savings were achieved as a result of participating in the project. An energy saving of 29500 KWH or financial savings of €4100 per annumwas achieved through energy efficiency measures and production efficiency.